The 2nd Annual International Surf Therapy Organization Conference was held in Jeffreys Bay. Twenty-eight individual representatives attended, representing Surf Therapy and research institutions from 11 different countries around the globe. The International Surf Therapy Organization (“ISTO”) was formed in Cape Town in September 2017 by eight founding contributors. Conceived by South African NGO Waves for Change, with funding support from Comic Relief, The Laureus Sport for Good Foundation and the World Childhood Foundation, ISTO connects practitioners, shares best practice, and executes global research studies so that understanding and support for Surf Therapy grows. Now in its second year, the ISTO conference brought together practitioners and researchers from across the globe to share best practice and present emerging research in the Surf Therapy space. The results from the first global survey of the Surf Therapy sector were also shared. The survey documents surfing’s impact on at-risk populations around the world. Organizations working with veterans, children with different abilities, survivors of trauma, children in conflict with the law and adults with anxiety and depression submitted aligned data that shows Surf Therapy is improving the mental and physical health of children and adults from myriad backgrounds. Held concurrent to the World Surf League 2018 Corona Open J-Bay surf contest, several of the world’s top male and female surfers visited the conference and signed the International Surf Therapy Declaration. The Declaration’s stated goal is to raise awareness of Surf Therapy as a health intervention and treatment, and to connect the public to the growing body of evidence that surfing and the ocean positively impact our mental health. The conference also released a shared online toolkit for ISTO member researchers and practitioners involved in Surf Therapy around the world. Developed with contributions from leading international Surf Therapy organizations, this collaborative toolkit provides essential information for organizations looking to establish, grow and evaluate Surf Therapy programs, helping them reach and impact their target populations. Additionally, for the first time in recorded history, Ph.D.s in Surf Therapy will be pursued by two ISTO members who aim to execute ground-breaking research in Surf Therapy and its efficacy. Finally, the conference laid out a 12-month strategy which will culminate with the 3rd Annual International Surf Therapy Conference in Lisbon, Portugal in September 2019. In the run-up to Lisbon, ISTO will be conducting outreach to include more Surf Therapy organizations from around the globe, including Asia-Pacific and South America regions. Current Contributing Organizations: Waves for Change, Wave by Wave, Surfers Healing, A Walk on Water, Waves of Wellness, Liquid Therapy, The Surf Project, Kind Surf, Jimmy Millar Memorial Foundation, Wave Project, Indo Jax, Live for More, AmpSurf, Warrior Surf Foundation, Surf4Dem, Urban Surf for Kids, City Surf Project, Groundswell Community Project, Stoked Research, University New South Wales, Edinburgh Napier University, UNICEF, Antioch University, Comic Relief, Laureus Sport for Good Foundation, World Childhood Foundation, RTI. 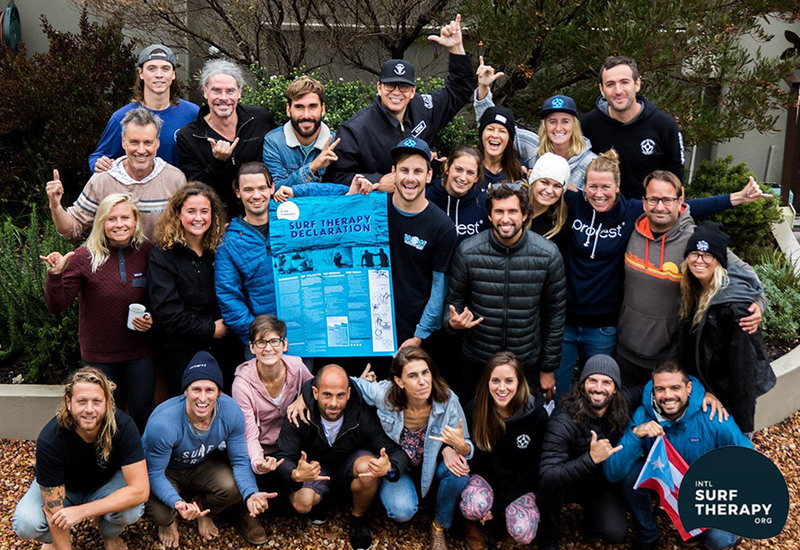 ISTO Members (with Aritz Aranburu) holding the International Surf Therapy Declaration, signed by numerous professional surfers including Kelly Slater, Carissa Moore, Steph Gilmore and Lakey Peterson. This entry was posted in Community Building, Events, Latest News, Media, Surf Therapy and tagged ISTO, Surf Therapy.